Heap Dawson Limited specialise in the design and manufacture of a large range of industrial heat exchangers and associated equipment. 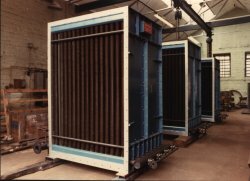 Our range of extended surface and plain tube heat exchangers are particularly suited to heating, cooling, air conditioning and industrial drying applications utilising steam, water and thermal transfer oils etc. All heat exchangers are designed and manufactured to meet our customers' specific requirements, hydraulically tested prior to despatch to a minimum 35 Bar (g) unless otherwise specified and manufacturers test certificates issued accordingly. Standard materials of construction include; steel tube/steel fins, steel tube/aluminium fins, stainless steel tube/ stainless steel fins, stainless steel tube/ aluminium fins and steel tube/copper fins. 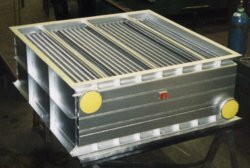 Heat exchangers manufactured from carbon steels can be hot dip galvanised after manufacture. 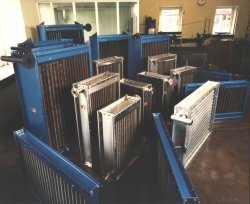 The photograph to the left shows a typical air cooler manufactured from aluminium finned carbon steel tubes and comprising eight sections of extended surface tubes welded into fabricated steel headers. The casing design is airtight and stiffened to withstand a negative pressure of 600mm wg. Heap Dawson Limited provide a comprehensive technical advice and design service for all its range of products including extended surface and plain tube heat exchangers. Heap Dawson Limited manufacture a comprehensive range of spirally tension wound carbon steel and stainless steel extended surface finned tube suitable for industrial and commercial heating/cooling applications. The tension wound fin ensures positive mechanical contact with base tube giving high surface area and excellent heat transfer characteristics. 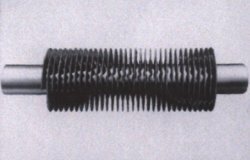 Finned tube can be supplied with plain ends suitable for welding or alternatively screwed or flanged ends can be manufactured to accommodate the many different types of application. Large Bore finned tube is commonly used in space heating applications such as greenhouses and under seat heating of public buildings where its compact dimensions are well suited. Data sheets are available on request giving technical details covering our range of small, medium and large bore carbon steel finned tubes and also our standard stainless steel finned tube. Carbon steel specifications include BS 1387 and ASTM A106-B. Stainless steel grade 316L/304L to ASTM A249/A213. We welcome the opportunity to discuss any requirements you may have. 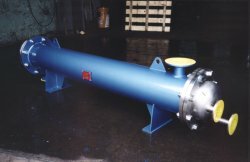 The heat exchanger was manufactured as a four pass unit, (water tube side), and arranged for simple skid mounting. Heap Dawson Limited specialise in the design and manufacture of a large range of industrial heat exchangers and provide a comprehensive technical advice and design service for all its range of products. Our subsidiary company Heap Economiser Limited specialise in the design of heat recovery systems and heat exchangers designed specifically to heat pressurised boiler feedwater by means of the exit flue gas when firing on Natural Gas. The heat exchanger or economiser is installed in the boiler exit flue gas stream and comprises sections of extended surface tubes through which the pressurised feedwater is passed, after the pump in a contra-flow arrangement. This increases the feedwater temperature and gives improved efficiency resulting in direct fuel savings. With dual fuel fired boilers and when firing on oil then the flue gases must be diverted away from the heat exchanger to avoid fouling and rapid corrosion. 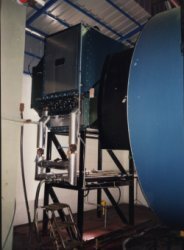 Economisers can be supplied complete with transformation sections and include integral by-pass and damper assemblies to suit individual site installations. Where the boiler is fired on gas only then heat exchangers can be installed directly into the exit flue gas ductwork without the need to incorporate by-pass. 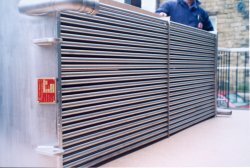 All our heat exchangers are manufactured to the highest quality in accordance with the latest British Standards and meeting the requirements of Insurance Companies and Third Party Inspection Authorities. Economisers are hydraulically tested at our works to a minimum 37.5 Bar (g) and test certificates issued accordingly. 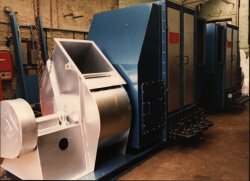 Our range of economisers is completely flexible for duty, size and configuration; each unit is designed and built for its individual application. Copyright © 2004 Heap Dawson Limited. Copyright of all documents, text and graphics on this site is retained by the original author.